I arrived in the Liaoning city of Anshan late on a winter afternoon. Although I'd thought to visit the city many times – it wasn't very far from were I was living at the time in Dalian – my first stop-off was a matter more of necessity than anything else. The long train from Hohhot in Inner Mongolia, where I'd ended my week-long holiday that semester, terminates there, and it was the closest I could get to home. Anshan is right on the rail line that jets up the Liaodong Peninsula before twisting off around the shoulder at Jinzhou to head south again towards Beijing. I'd passed it many times, and had always made a point of peering out the train window to catch what I could of the place before the carriages rushed on past. I'd been told by friends that it was a small, unremarkable place that was smoky and dull, but despite this, I'd always been curious about it. I think it was the city's name that really stuck on me – the word 'an' sounds like the Chinese word for 'peace', and just to voice the word 'Anshan' imparts a melodious quality that gives it fairytale appeal. In any case, the city I saw from the windows of the train was far from smoky. Across the boundary of the railway station line, I spotted an impressive assortment of high-rises, and as they flashed past my window it was hard to imagine that the city was in any way unattractive. On night journeys, it had shone colourfully, which even more lent to the mysterious and romantic air occasioned by its name. Leaving the station on that cold, winter evening, I was at once reassured that Anshan was indeed no mere ugly provincial town. In the cool, the central city area immediately before the station was an exemplary public space – the slope leading up from the station was spacious and open, and at the crest of the rise lay a stretch of the office towers I'd seen from passing trains. Many railway station front courts in China are crowded and filthy – Anshan was a welcome exception to the rule. By morning it seemed even more attractive – Anshan in the bright morning sunlight, sharp and crisp in the winter cold, was a striking sight. The same area I'd walked around the previous night whilst checking for a hotel was in the morning filled with carts – all selling glistening, vivid red skewers of toffeed crabapple and strawberries. I'm partial to the latter and cracked the toffee between my teeth as I sucked in the fruit: shards of scarlet toffee scattered out over the thin layer of white snow. I wandered through Anshan's back lanes only to discover that nowhere within walking distance of the train station was as my friends had described. All those narrow little streets were well-swept – I noticed ladies in green uniforms with headscarves carrying straw brushes for the job. Anshan has great character, and I was more than pleased I'd chosen to take a day to investigate the town rather than head straight back for Dalian. Anshan is regrettably missing from the average tourist itinerary – even serious China adventurers tend to give the place a miss, and most travel guides fail to mention it at all. Those publications that have overlooked the town have missed the opportunity to cover one of Liaoning Province’s most noteworthy attractions – the temple-studded mountainous valley of Qianshan. The name ‘Qianshan’ means ‘a thousand mountains’ – in fact, there are 999 of them, and it is said that every single one is a spectacle on an awesome scale. The area is enthralling – local Chinese tourists, who visit regularly, compare the site with the more well-known Changbaishan mountain range on the border of Korea in Jilin Province to the north. The mountains give rise to towering cliffs and sheltered valleys where, ever since the Shui Dynasty and in successive dynasties ever since, devotees have been constructing temples for worship. There are 13 in total, and what’s unusual about this group is that both Buddhist and Taoist temples share the same complex harmoniously. Besides the temples, there are also nine palaces and twelve Buddhist convents. The temples themselves have been designed in exactly that way – along harmonious principles – built to fit in seamlessly with the natural surrounds. Mountains enclose temples, and temples are hidden within their slopes; temples have been built right on mountain peaks and others along the mountain sides, according to the cardinal principals of fengshui. 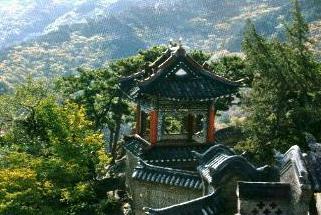 Many pagodas too share the temples’ outlooks and give the area an even more ancient Chinese character. 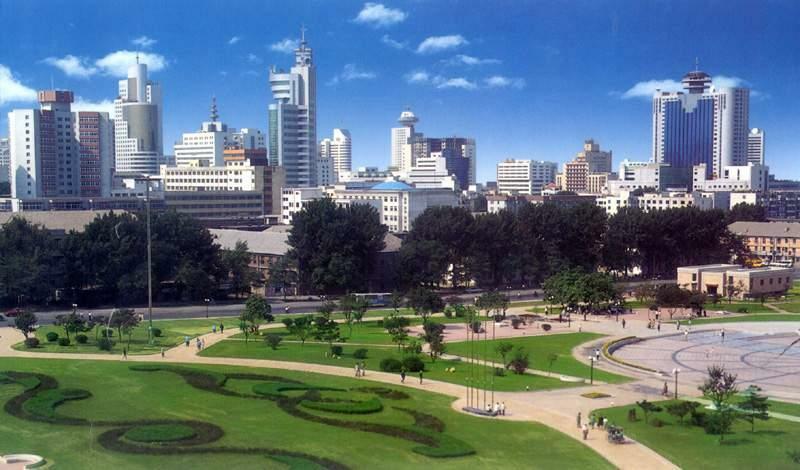 Seventeen kilometres from Anshan to the southeast, Qianshan is well serviced by busses from the town. It’s a huge park – 152 square kilometres in size – and contains over 180 scenic attractions, amongst which unusually grotesque rock and pine formations arouse the perverse fascination of many visitors, as well as colourful flower beds and quiet, shaded spots beneath the cool mountain slopes. Qianshan has attracted the pious and the humble over the centuries, as well as the imperial – the Qianlong Emperor was a frequent visitor – and the scholarly, who left many works of calligraphy behind to record their inspiration. Many of those carvings, plaques and tablets remain, amongst which many works of poetry give testimony to the profound scenery. The temples are invaluable heritage pieces that contain many ancient texts and artefacts shedding light on religious practices and beliefs of the age. The largest Buddhist temple, the Longquan, is an ancient structure dating from the Tang Dynasty that features seventeen halls – although it is not usually considered as impressive as the Qing Dynasty Wuliang Taoist temple, which is the largest of the whole series. Surrounded by stirring natural formations and relics – mountainous platforms, dagobas, an arhat cave and rock shapes, Wuliang temple is the highlight of any visit to Qianshan. I wasn't, at the time I was visiting, terribly clear what Anshan's principal attractions were. Asking around led me to believe that the city's main claim to fame was that it was the home of the world's largest jade Buddha. Whilst this is probably an accurate claim, it's important to clarify. The reason for this is that I'm certain that most visitors to China who would wish to see such a thing as a large Buddha will probably want to see an attraction with a ring of authenticity – and that usually has something to do with the age of the artefact. Thousands of visitors every year flock to see the mountainside Buddha at Leshan, a little way from Chengdu, which has stood for twelve centuries. The world's largest wooden Buddha is in the Puning temple in Chengde, several hours drive north of Beijing, and that was erected in 1755. Another large Buddha probably worth seeing is the many-armed Buddha in the back streets of Dalian's Economic Development Zone - whilst it may not be ancient, it may well be the world's largest lucky shop Buddha – the usually six-inch high variety you see in Chinese takeaways worldwide – which is four stories high and sits in the factory yard. Anshan's Jade Buddha isn't ancient at all, in fact, it was constructed intentionally as a record-breaker, an attempt to hit the Guinness record-book not at all dissimilar in nature to the world's largest cream bun or the world's longest kiss. In that respect, it's a nice piece of work: as an icon of spiritual significance, that depends on the nature of your own Buddhism, and if you're a tourist, it's only worth seeing if you're an enthusiast. Housing the Jade Buddha is a veritable suburb of newly-rendered, traditionally-styled, old-fashioned Chinese buildings. A two kilometre bus ride from central Anshan, the complex is brightly coloured and features other shiny and smartly finished Buddhas about the place – but the star attraction itself is walled off from view behind an ostentatious gate – which costs about as much to pass as it does to visit the Forbidden City. It is an impressive piece of work, it must be said. 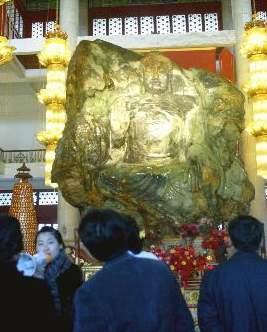 It is indeed the largest Buddha carved out of jade, and it may well be the largest piece of carved jade that exists at all. Standing at almost seven metres tall, the jade’s natural colour variations have been taken advantage of to express seven different aspects of the Buddha – it’s actually quite remarkable how the jade’s own colour precisely demarcates the Buddha’s robes and palm. Positioned around the Buddha are twelve pieces in marble that tell the historical story of Gautama Buddha, reminiscent of the Twelve Stations of the Cross. Walk behind the Jade Buddha, and you’ll see that on its reverse a second image has been carved of the Avalokitesvara Buddha. I didn’t spend too long with the Jade Buddha, however – I was looking forward to spending a few more hours wandering Anshan before my train left for Dalian. Anshan, I had decided, was every bit deserving of its euphonious name, and I looked forward to having the opportunity to return in the future.